I’m interested in how people perceive the visual and digital worlds and how we measure and predict these perceptions – particularly for texture-rich designs and products. I’m also interested in extending the use of our data-mining and data-visualisation to helping folk understand the structure and content of ICT research in the UK through our ICT Perceptions project. Can we predict how rough/glossy/directional/regular you think a texture-rich surface is? Can we increase customers’ interest and engagement in digital presentations (particularly e-retail) of texture-rich goods using rich, highly interactive media? Do we know what emotive properties that we have to communicate to you so that you will press the ‘buy’ button? 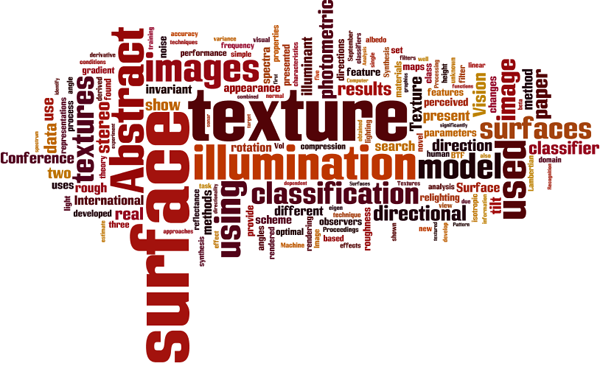 Can we understand the structure and dimensionality of how people perceive complex surface reflectance and texture properties? Can we use clustering techniques and other data-mining techniques to help us understand and promote discussion of ICT research?